Phineas Bogg and Jeffrey Jones: Voyagers! Educational television is almost an oxymoron. And yet, in the fall of 1982, the television networks were mandated by the Federal Communications Commission that on Sunday nights at 7/6 central, programming had to be either educational or public affairs presentations. The #1 show on television at the time was CBS’ 60 Minutes, airing in that slot. And so, not only did any prospective “sacrificial lamb” entertainment show have to go up against that ratings juggernaut, it also had to conform to the “educational” constraint. NBC’s answer: Voyagers! 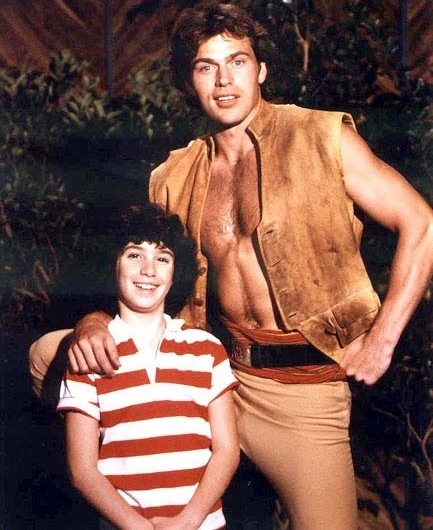 Phineas Bogg (Jon-Erik Hexum) is a Voyager. Lifted from his own era, he (and others like him) journey through time and space, correcting the events of history where necessary. They travel using a device called an “Omni”, which has a date, location, and red and green lights (if red, something has gone wrong; if green, time has been fixed correctly). Ordinarily, Voyagers also all have Guidebooks, a sort of manual telling them the way time is “supposed” to turn out. Bogg, unfortunately, lost his Guidebook, in the process of saving a young boy from the year 1982, Jeffrey Jones (Meeno Peluce). Jeffrey, however, turns out to be better than any printed Guidebook. He has become a walking history textbook, having essentially memorized his recently deceased father’s work (his father was a history professor). So now, Bogg and Jeffrey travel through time, fixing the timeline, occasionally messing it up (but not so badly that it can’t be fixed by the end of the episode), and meeting up with the greatest figures of history. Cleopatra and Bogg, in New York City! Other episodes featured such notables as the Wright Brothers, Harriet Tubman, Abraham Lincoln, Marco Polo, Douglas MacArthur, and Thomas Edison, to name but a few. Events throughout history were portrayed, including the almost obligatory “time-travel” trip to the Titanic, in which Bogg and Jeffrey meet another Voyager, and find that the ship may go down with the Mona Lisa on board! All this was in keeping with the mission of making the show educational as well as entertaining, with varying degrees of success. The show also needed to attract adult viewers as well. 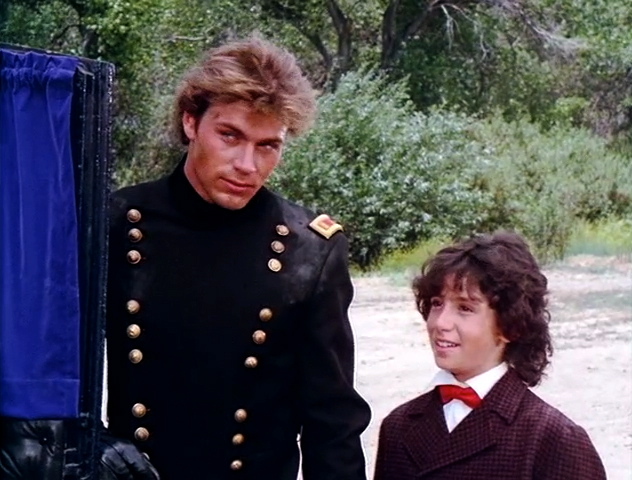 Jon-Erik Hexum had matinee-idol looks, and Bogg had a distinct tendency to fall into a romance with most every good-looking female in any particular episode. The show was also full of action sequences, from an aerial battle with the Red Baron to the surprise attack on Pearl Harbor. It was difficult, if not impossible, to recreate ancient Rome one week and 1920’s New York the next, especially on a modest TV budget. Extensive use was made, therefore, of both the Universal film library and of the Universal Studio back-lot. Universal, at one time, had an incredibly extensive film library. They had done tons of pictures of all kinds, and if you needed a scene of the Pearl Harbor attack, they had footage of Japanese Zeros dogfighting. If you needed pirate ships, an attack on the Alamo, or old film from an Errol Flynn Robin Hood epic, they had those too. And Voyagers! was tailor-made for such a wide variety of stock footage, from Cleopatra to the beginnings of the US/USSR Space Race. It saved all kinds of money as well… which is also why the back-lot got so much use. In 1982, the Universal back-lot wasn’t really a tourist attraction. That’s being kind. It was almost a forgotten place as far as the public was concerned, even though the studio tour buses were still going through on a regular basis. It wasn’t the type of “theme-park” experience that it is today. It was still very much a working studio area, even though it wasn’t being used nearly as much as it had been in its heyday. And yet, it was a perfect place for Voyagers! Worse yet, the structure of most episodes required not one, but two different time periods. For example, Cleopatra ends up being accidentally transported with Bogg to 1920’s New York, which means in this one story we have ancient Egypt and period NYC, which probably can’t double for each other! How many sets can you reuse in an episode featuring both Albert Einstein and Marco Polo? You get the idea. It was an ambitious series, but one that had to pay for that ambition somewhere. And that was even with Hexum’s extraordinary efforts, personally, to get it renewed. NBC was ready to pull the plug after 13 episodes, but needed a replacement that fit the “educational” constraint. Their planned show from their news division, Monitor, wasn’t quite ready. Thanks to the combination of a fan letter-writing campaign and Hexum himself spending $5,000 of his own money to print and send out posters to schools advertising the series, the network ordered an additional 7 episodes of Voyagers! These 7 episodes (along with the final episode of the original 13) showed a slightly different take on the show, developing a mythology of sorts and showing other Voyagers, including a continuing nemesis for our heroes. 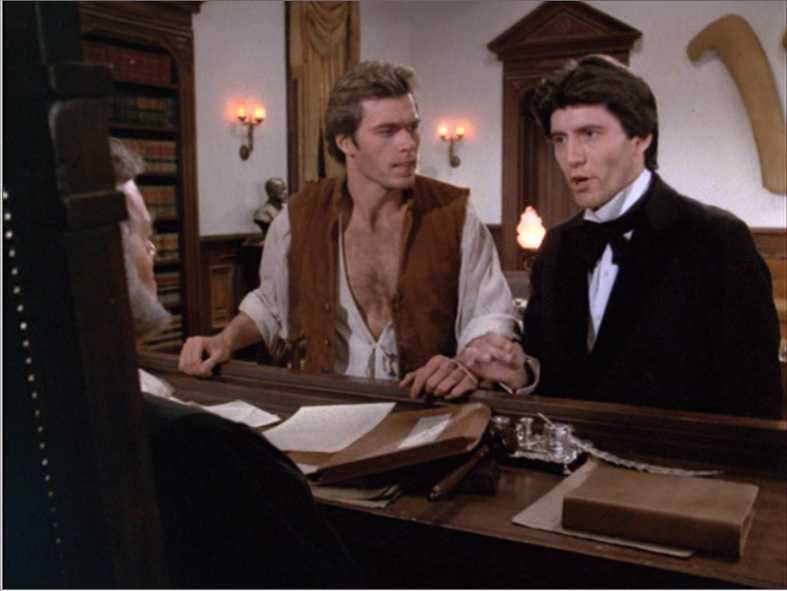 The time-travel stories also tended to have at least one more modern element each episode (something the adults watching were more likely to relate to as a memory rather than just an event plucked out of a history book). It was also revealed that Jeffery’s presence wasn’t quite as accidental as originally portrayed, and that he was always destined to become a Voyager. Finally, however, time ran out, and the show was cancelled in the spring of 1983. If only there was some way to go back in time and fix that obvious mistake in the timeline. 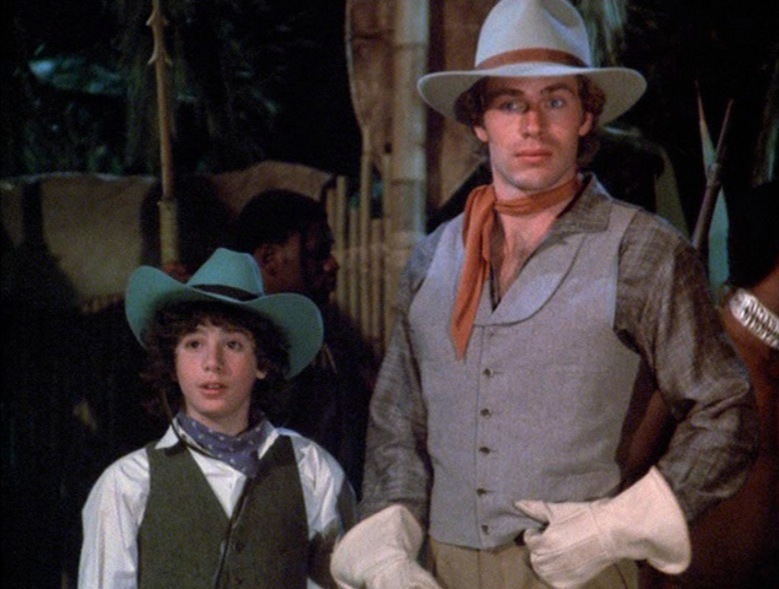 JON-ERIK HEXUM’s first real Hollywood job was being cast as Bogg in Voyagers!, although he had turned down roles in The Dukes of Hazzard and CHiPs. He followed with a high-profile role in the TV-movie Making of a Male Model, and in the fall of 1984 was the male lead in a new series called Cover-Up. During the filming of that series, he accidentally was killed due to injuries received from a prop gun which he was holding. Many believe that he was destined to be a huge star, had his life and career not been cut short at the age of 26. MEENO PELUCE had been a frequent guest star in many series as a youngster, prior to Voyagers! He had also been a regular in the TV series version of The Bad News Bears, and the comedy series Best of the West. After his role as Jeffrey, he performed in more guest roles, including appearing with his real-life half-sister Soleil Moon-Frye on Punky Brewster. As an adult, he not only was a history teacher (ironic, isn’t it? ), but has established himself as a professional photographer, with portraits of many stars and musicians. Series creator JAMES PARRIOTT has been involved with many genre series, coming to Voyagers! after having produced The Incredible Hulk and The Bionic Woman. Thereafter, he produced, among others, Misfits of Science, Forever Knight, Dark Skies, Threat Matrix, Grey’s Anatomy, Sons of Anarchy, and most recently, Defying Gravity. With that list, his name will show up again in this blog, I’m certain. JILL SHERMAN (now Jill Sherman-Donner) also worked on The Incredible Hulk, and was a producer/writer for Magnum P.I., Freddy’s Nightmares, and (though she is loath to admit it) Baywatch. If you want to learn more about Phineas Bogg, Jeffrey Jones, or the Voyagers! series, then take a voyage down to your public library…. wait. Instead, you can check out The Voyagers! Guidebook, with a timeless(!) array of information and great pictures from the series, as well as information on three scripts that were never used in the show. Our modern version of time travel, the DVD set, is available as well. Although sadly lacking in extras, it is still amazing that a show that did as poorly in the ratings as Voyagers! got a DVD release. Maybe our memories are the best time travel of all. That’s why this blog exists, you know…. 20 aired episodes — no unaired episodes exist. Actually aired at Friday, 8/7 Central: Yes. Once, actually. On Dec 3, 1982, NBC aired an episode as an experiment on a Friday night. Networks can’t resist.